Skin tags are harmless, and you don't need to remove them unless they bother you. Skin tags on the breast might pose an irritation risk because they commonly occur along bra lines or under breasts where there's regular friction. Doctors most commonly cut off skin tags. You can do the same at home, but MedlinePlus recommends you let a doctor remove your doctor remove your skin tags to prevent infection. 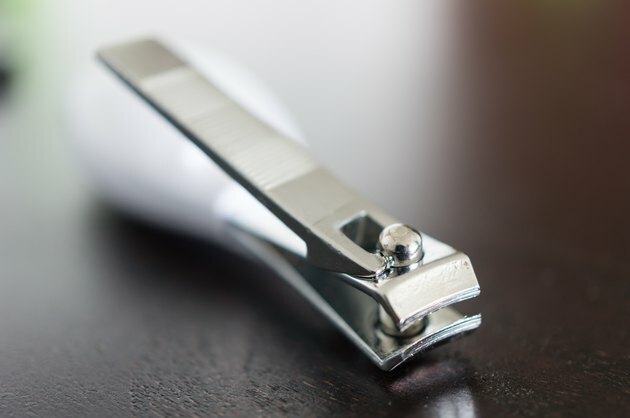 Sterilize metal nail clippers by submerging them in a pot of boiling water for 10 to 20 minutes. Allow them to cool. Clean and dry your skin tag. Apply a topical over-the-counter anesthetic to numb your skin tag. This is optional but can prevent pain. Clip the skin tag off at the base with one quick, firm motion. Apply clean gauze to the area immediately and hold it there with slight pressure until the bleeding stops. Skin tags contain blood vessels, so you may experience quick and moderately heaving bleeding at first. Apply an over-the-counter antibiotic ointment and a clean bandage. Clean the wound, reapply the antibiotic ointment and change the bandage two to three times daily. See your doctor right away if your skin tag shows signs of infection, like pain, weeping or pus. Seek help if your skin tag wound bleeds profusely or continues to bleed slowly for more than a day.